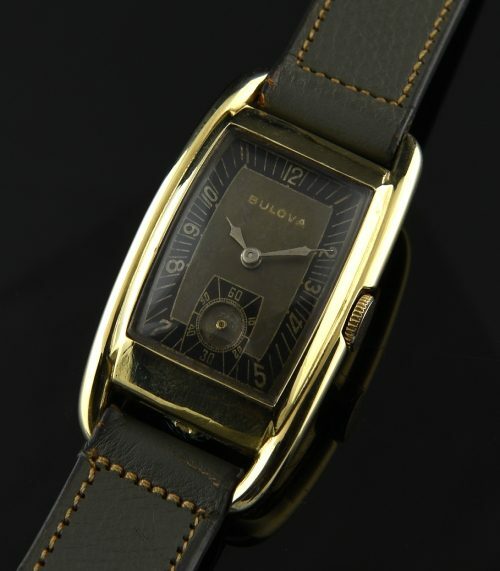 This is an incredibly well preserved vintage BULOVA known as the “Oxford” and produced in 1939. This watch a MASSIVE watch for its era, measuring 24.6x42mm. in a VERY attractive tonneau shape. This tri-coloured (original) dial is seldom seen-especially in this amazingly preserved condition. The 7AP manual winding BULOVA movement was just cleaned and is accurate. We’ve installed a 40’s unused leather band to complete the look. You won’t regret this purchase, as this watch looks great on the wrist.